Clément Cogitore’s strong “Neither Heaven Nor Earth” reminds one of “L’Avventura” and “About Elly” in how those films use disappearance as a thematic tool more than an unsolved mystery demanding resolution. Cogitore defines his setting well, focusing on the wind, sun and sand of Afghanistan 2014 as a French group of soldiers keep the fragile peace and plan for departure. It’s a world that seems mostly harmless, but an early shoot-out with Taliban in the hills makes it clear that the potential for danger remains. It’s in this unique setting, a place that inherently feels like purgatory for those stuck there, that Cogitore crafts a tense tale of faith and mystery. After an encounter with a man and his sheep who get too close to their guard post, a pair of French soldiers in Afghanistan, well, disappear. One night, they’re watching figures on the horizon. The next morning, they are simply gone. Satellite images of the area offer no insight. The commander, a confident man named Antarès (Jérémie Renier), is naturally convinced that they were kidnapped by local opposing forces. Through a translator, he interrogates the denizens of a local village, but his men have simply vanished off the face of the Earth. He orders everyone to keep their disappearance secret until he can figure out what is going on. Then more men disappear. In this rock-strewn middle of nowhere, a man partnered with another soldier in a bunker steps outside to urinate. We watch him through the door, knowing that danger—both physical and possibly supernatural—lurks over the horizon. Our movie-watching sensibility trains us to fear for his safety. We’re in the bunker, he’s out in the dangerous world. He returns to the bunker and his fellow soldier is gone. This scene really sets the tone for “Neither Heaven Nor Earth” given it’s unbroken nature—we know no one could have come in and kidnapped this man—and the way Cogitore smartly keeps us in the bunker, where something happens. Exactly what that something is starts to drive Antarès crazy. As fear starts to overtake the soldiers underneath him, this practical leader questions what he knows as true—men don’t just disappear. 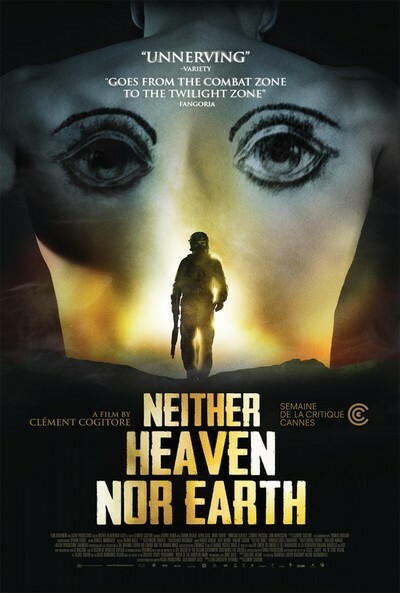 “Neither Heaven Nor Earth” is effective more as a study of fear and failed leadership than it is as a horror movie. In fact, if it has a weakness it’s that audiences expecting it to build to something tenser or even terrifying will be disappointed. It drags a bit around the hour mark when it needs to be building tension and/or deepening its thematic points. There’s also an underdeveloped subplot of sleep deprivation, in that everyone becomes convinced that sleep-time is when people are taken by whatever force is removing them from this barren landscape. Terrified and sleep-deprived in a war-torn country? There are times when I wanted those feelings to register more primally and emotionally than Cogitore seems interested in doing. Most of the directorial flaws and arguably wasted opportunity of the final act of “Neither Heaven Nor Earth” are offset by the unshowy, grounded way in which Renier grounds the film. A regular collaborator of the Dardennes brothers (“L’Enfant,” “The Kid with a Bike”), Renier has the natural charisma of a born leader that’s fascinating to see undermined by the unique situations he finds himself in. While Cogitore generally allows viewers to play with the film’s themes to whatever degree they desire (don’t all men disappear to some extent during war, for example), Renier has to play the reality of the situation, and does so admirably. It’s his plight—that of a man trained to be rational but now faced with the irrational—that keeps “Neither Heaven Nor Earth” moving. And like those films that inspired it that I mentioned in the introduction, it’s not the solution to the mystery that matters but what the mystery itself does to those who face it.